Honey is a sweet food made by bees using nectar from flowers. Honey bees convert nectar into honey by a process of regurgitation and store it as a primary food source in wax honeycombs inside the beehive. Apiculture, the practice of beekeeping to produce honey, dates back to at least 700 BC. It is important to keep honey stored in an airtight container so that it doesn't absorb moisture from the air. Honey stored this way in a cool dry place will keep almost indefinitely. Honey is a mixture of sugars and other compounds. 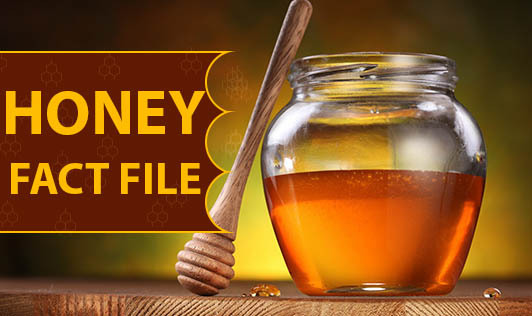 Honey is mostly sugars and contains only trace amounts of vitamins or minerals. Honey also contains tiny amounts of several compounds thought to function as antioxidants. Honey contains the phytonutrients which have antibacterial, antiviral and antifungal properties to keep your immune system healthy and ward off cold and flu. Honey contains primarily glucose and fructose, which strongly attract water. Because of this, honey can absorb the water in wounds, drying it out faster to discourage bacteria growth and promote faster healing. It also contains the enzyme glucose oxidase that, when combined with water, produces hydrogen peroxide, a mild antiseptic. Honey can be used to improve the look and feel of skin and hair. Honey can be used as a facial mask to exfoliate skin and unclog pores. For dry hair, honey can be applied after shampooing to restore moisture and shine. Using honey during workouts produced more favorable outcomes than the use of other types of sugars. Honey is able to significantly raise blood levels of antioxidants. Higher levels of antioxidants can ward off cancer-causing free radicals and promote heart health. Do not feed honey-containing products or use honey for infants less than one year of age as honey may contain Clostridium botulinum spores and toxins that can cause infant botulism, a life-threatening paralytic disease. Honey is safe for children older than 12 months and adults. Myth: Honey and lime juice taken with warm water first in the morning helps you to reduce weight. Fact: Honey undoubtedly has medicinal properties, but it does not have any power to induce weight loss. No food has such powers. Honey slightly increases your metabolism. Myth: Honey is better than refined sugar. Fact: Honey is indeed a natural product and breaks down in the body as sugar. At the same time, honey contains a few trace vitamins and minerals and helps alleviate some health problems. All types of sugar should be consumed sparingly, including honey. Use honey in place of table sugar as a sweetener in your tea. Drizzle apple slices with honey and sprinkle with cinnamon powder. To enjoy sweetened curd mix a little honey instead of sugar. A delicious sandwich that is enjoyed by kids of all ages is a combination of peanut butter, with bananas and honey. If you have a craving for sweets, have a bowl of fruits with honey.